It has long been known that consuming too much sugar leads to metabolic changes that result in diabetes, weight gain, obesity and cardiovascular disease. In an attempt to allow people to ‘have their cake and eat it too’ food-stuff manufacturers introduced and heavily marketed artificial sweeteners as a “healthy” alternative to sugar. However, research over the past decade has shown that consuming artificial sweeteners leads to metabolic derangements that actually promote the very things they are marketed to help, namely blood sugar dysregulation, diabetes, weight gain and cardiovascular disease. A new study has begun to show us how. It has been known for a long time that artificial sweeteners cause weight gain and blood sugar dysregulation. In addition, recent studies have also shown that regular consumption of artificial sweeteners leads to an increased risk of dementia, Alzheimer’s disease, stroke and cardiovascular disease. Now, researchers are starting to determine how this occurs. In 2008, researchers at Purdue University released a study that showed animals fed artificially sweetened foods and beverages ate more and gained more weight than animals that were fed foods sweetened with glucose which is a natural, high-calorie sweetener. They postulated that this was due to a combination of dysregulation of the appetite center of the brain and increased insulin resistance. Further research showed that consuming artificial sweeteners induced changes in the flora within the gastrointestinal tract which led to blood-sugar spikes in some people, further exacerbating insulin resistance, which can then lead to weight gain and diabetes. Now, the largest study study ever conducted has been released which assessed the biochemical changes that artificial sweeteners and sugars cause in the body. 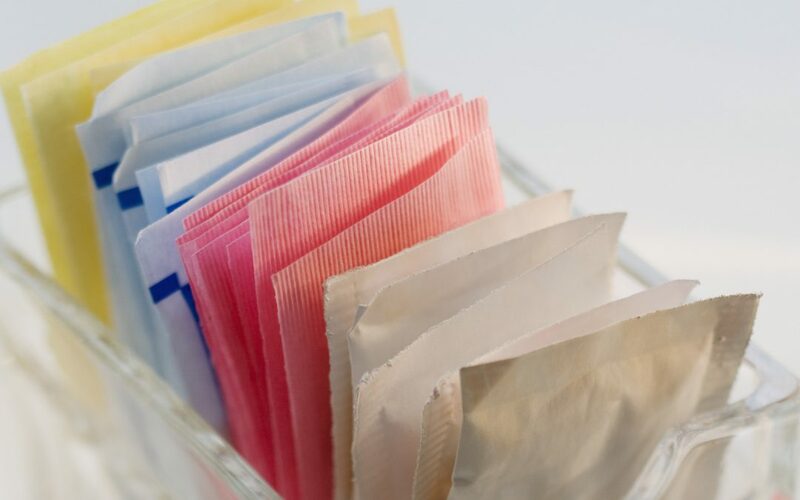 The research, conducted by researchers from the Medical College of Wisconsin and Marquette University, suggest that artificial sweeteners change how the body processes fat and how the body gets its energy, both of which are precursors to obesity and diabetes. The team fed rats diets high in glucose or fructose (both types of sugar) or the common artificial sweeteners aspartame (NutraSweet(R), Equal (R)) or acesulfame potassum. They collected blood samples after three weeks which showed significant changes in how the body processed fats and proteins and what it did with those substances. The research found that artificial sweeteners induced metabolic changes at the genetic level that could lead to diabetes and obesity. Specifically, the researchers found that aspartame and aceulfame potassium altered the expression of certain genes responsible for fat metabolism in the cells, increasing the amount of fat in the bloodstream. The researchers then exposed endothelial cells (the cells that line the veins and arteries in the body) to these sweeteners, and they detected marked dysfunction – dysfunction which could lead to atherosclerosis and cardiovascular disease – thus providing a mechanism to support previous findings that artificial sweeteners increase a persons risk of cardiovascular disease and stroke. Interestingly, both natural sugars and artificial sweeteners led to detrimental changes in blood sugar, weight gain and cardiovascular disease risk, but the changes were different. Based on this and previous research, artificial sweeteners appear to contribute to metabolic disorders by altering the activity of certain genes responsible for the breakdown of fats and proteins, which can lead to diabetes and weight gain. They also damage the endothelial lining, which can increase the risk of cardiovascular disease. This is different from normal sugars, which seem to contribute to cardiovascular disease through insulin resistance and by damaging the cells lining the body’s blood vessels via different mechanisms..
People are generally consuming artificial sweeteners believing that they are a ‘healthy choice’ or a ‘healthy alternative’ to sugar; research shows that this simply isn’t true. While the body has the machinery to deal with small amounts of natural sugar, too much of ‘a good thing’ turns out to be bad – if you eat too much sugar, bad things are going to happen over time, including weight gain, insulin resistance, diabetes, obesity and cardiovascular disease. In addition, there is a growing body of research that also demonstrates that you can’t simply replace sugar with artificial sweeteners in an attempt to fool the body; the body will adapt to those dietary changes – adaptations that result in the very diseases the artificial sweeteners are marketed to prevent.